We all know about the "crying call." But maybe it's time to learn how to let it go and "groan fold." It's hard to fold flopped sets. But sometimes you have to groan and bear it, and let your hand go. Do you ever know that you should fold in a live poker tournament and then don't? We all know about the "crying call." I suggest adding the "groan fold" to your arsenal. That's when you use the groan to distract your sense of injustice while your fingers flick your cards towards the muck before they get a hold of your chips. I recently had an opportunity to exercise this little known poker technique. 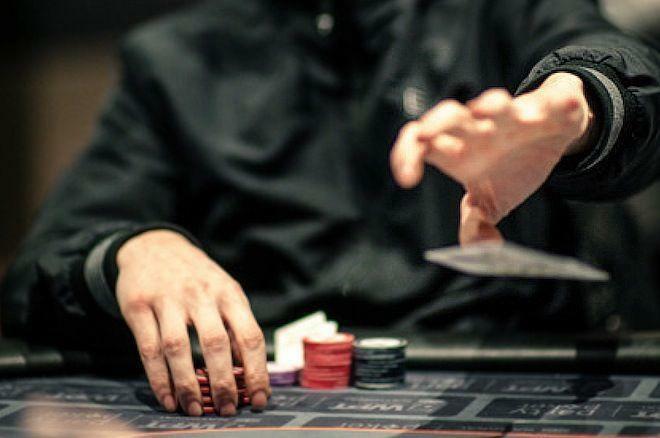 In a $1,000 live tournament a tight passive player had limped in from early position. I looked down at and limped as well. The button limped along and the big blind checked, so there were four of us to see the flop come . I was happy. It checked to me and I bet 1,100 into about 2,200. The big blind called and the early position player surprisingly called as well. The turn was the , bringing some wetness to the board, and it checked to me again. I decided to target some of the sticky parts of my opponents' ranges. Surely one of them had a good jack or a set of deuces or something. So I went for 3,500 into 5,500. The big blind made it seem like he wasn't happy about the size of my bet, but could not fold his hand. He called and the early position player folded. The river was the , making the board . Confidently this older recreational player slid out a gray 5,000 chip and said "four thousand." Let's run through some combinations. This player checked in the big blind and the is nowhere to be seen. So on the flop he can have all combinations of and . This proves unfortunate since those combos add up to 8 apiece. I assume he would raise on the turn and , too, for that matter. There are no other real flush draws on the flop that make sense for him to have had. That means from the available hearts there are , , , , , , , and to go with the , plus the same rundown to go with the . There are only 9 combinations of , a hand that would also make sense for him to take this line with, at least some amount of the time. So let's consider our price. We have to call 4,000 to win 16,500, meaning I have to be right just about 20 percent of the time to call. If our opponent has 9 combinations of and 16 combinations of flushes, I should definitely call and expect to win about 36 percent of the time — a healthy margin above 20 percent. Do I have stronger hands in this spot? Actually I do. There are lots of hands I wouldn't isolate the tight-passive limper with but that I would still want to play in position — hands like , , and even . I can also have and preflop, but I would probably check on the turn. On the river, I at least have a few hands that are better to call with in this spot. There aren't too many just because of the bet size I chose on the turn, so I am in a way close to the top of my range. On the other hand, I could have stabbed on the flop with an overlimped or and got there. In order to justify a fold in this spot, we would have to weight our opponent to be less likely to bet to this exact size with this exact physicality, confidence, and behavior. So if we were to say that he would do so 66 percent of the time, whereas he could bet any flush like this 100 percent of the time, that would change the weight of the combinations from 6 to 18. Which, actually, would still mean we should call, since we are winning 25 percent of the time and need to be right a shade less than 20 percent. This isn't a spot where we are playing exactly chip-EV, but it is early in a tournament and it is not for our tournament life, so the effects of $EV will be small here. The available evidence meant a fold was possible. I had a chance to let my fingers push my hand away instead of reach for chips, meanwhile groaning to myself about having to let go of my set. But I called on this occasion and was privileged to see for the rivered flush. Looking back, it was a spot where instead of a crying call, I might have chosen the "groan fold."